An Irish life sciences company is to create 600 high-skilled jobs in Dublin over the next five years, as a result of an investment of up to €350m. The expansion will enable Genomics Medicine Ireland to speed up plans to map the genetic blueprint of 400,000 people in Ireland in the search for better diagnostics and treatments for a range of illnesses. As part of the plan, GMI will become an independent subsidiary of US firm WuXi NextCode, a company that makes a technology platform for genetic sequencing. A number of investors, including the State-backed Irish Strategic Investment Fund, will also inject funding into GMI. "We see the potential for significant skilled job creation and great commercial returns as well," said Paul Saunders, Senior Investment Director at ISIF. "So it is a very good fit with the bottom line of commercial return and economic impact." 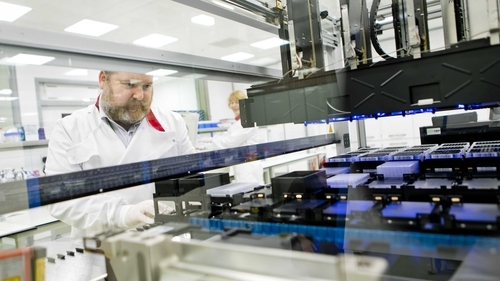 GMI will use the capital injection and access to WuXi NextCode expertise to rapidly expand its whole genome sequencing programme - one of the largest in the world. It aims to decipher the genetic blueprint of 400,000 volunteers in Ireland or 10% of the population, including patients with a range of common and rare diseases. It intends to then use that data to discover the genetic causes of particular illnesses, information which could then be used to develop more accurate diagnostics and precision medicines for treating them. "It is thrilling to be in a company which is at the forefront of science," said Anne Jones, CEO of Genomics Medicine Ireland who recently joined the business. "But also the possibilities of being able to figure out what are the causes of particular diseases, and then work with pharmaceutical companies to develop treatments and diagnostics means that in the future hopefully for some existing patients we can help with their treatments. "But also for their future for their families and for the people of Ireland it really has a strong future impact in terms of positive healthcare for the country." Ireland is considered an excellent location in which to conduct such research because it has a relatively homogeneous population, making important genes easier to identify. The size of the population here also means there are significant numbers of people with both common and rare illnesses. Experts say the healthcare and medical research facilities in Ireland are a high enough standard to support such research, while the population here has in the past shown a willingness to get involved in such studies. As a wider aim those behind the plan hope to position GMI as the cornerstone for a Silicon Docks-modelled International Centre for Advanced Life Sciences (ICALS) in Ireland. The backers say such a centre could attract companies and researchers involved in precision medicine development, medical genetics services, digital health and cloud computing. A similar ecosystem has developed in San Diego, with 1,225 life science companies and 80 independent and university affiliated research institutes generating $33.6bn for the economy and employing 37,790 people. "We see this as something that will develop over time," said Mr Saunders. "We think there is a great potential in Ireland to develop a leadership position in the European context if not the global context in advanced life sciences and genomics. "We have the skills base in pharma and in biotech and also in technology and data science and genomics really sits at the convergence." In total €197m will be committed to GMI in the short term, but this will rise to €350m in the medium term if milestones are met as GMI grows and the ICALS develops. ISIF will be contributing €61m to the project, with well-known investors ARCH Venture Partners, Polaris Partners, Temasek, Yunfeng Capital and Sequoia Capital also involved. WuXi NextCODE is considered to be the emerging global standard platform for genomics, or the study of the genetic blueprint that makes us all unique. "They say the 21st century is the century of biology and genomics is at the core of that," said Rob Brainin, CEO, WuXi NextCODE. "You think back 100 years ago to when people did blood transfusions and they didn't do blood types." "I think we are going to look back 100 years from now and think about people doing individualised healthcare without using genomics...it is going to seem a bit archaic." Founded in 2015, GMI is currently carrying out genomic research into a range of diseases, including Multiple Sclerosis, Alzheimer's disease, brain tumours, Inflammatory Bowel Disease, Ankylosing Spondylitis and other rare diseases. It gets the DNA it uses in research from partnerships with research and clinical institutions as well as through partnerships with organisations that support patients with particular diseases. The amount WuXi NextCODE paid for GMI has not been disclosed. According to Anne Jones, consent, privacy and data protection around DNA samples are central to its operations. "First of all we always get permission from patients when we are taking their samples from them," she said. "But most importantly the samples are collected at the clinic and at the point of collection in the clinic that data is encrypted, so we do not have direct access to understand who the patient is. "It is further encrypted when it comes into our organisation."